Who says that real men don’t eat Quiche, especially one without meat? Well, this one does, thanks to my lovely and talented wife! 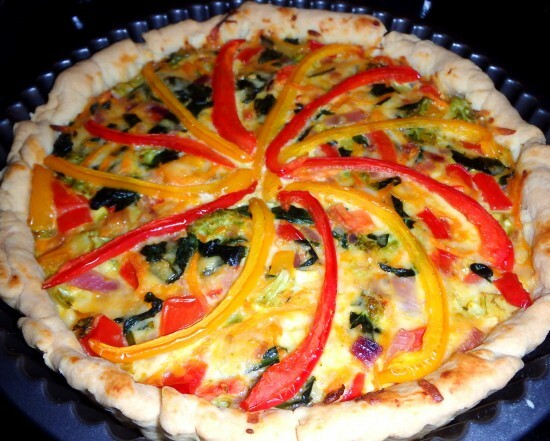 Kim makes the best vegetable Quiche I have ever tasted. We had friends over on Saturday for a basic and advanced soap making workshops, and invited them to lunch. 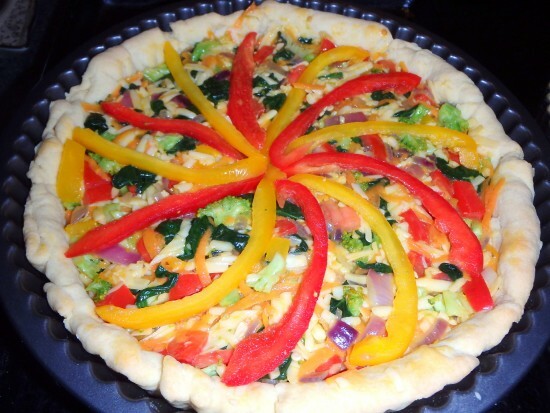 Kim whipped up this wonderful Quiche with green salad and jacket potato. It was light working lunch in between classes. Kim has graciously allowed me to share the recipe with you all. Ready to go into the oven at 180°C for 35-40 minutes. Pre-heat oven to 180°C (350F). Add butter. Cut into flour with a knife then run in with fingertips. The mixture should resemble fine breadcrumbs. Sprinkle water over the crumbs. Mix to a stiff crumbly looking paste with a large spoon. Draw together with fingertips, turn out on to a lightly floured surface. Knead quickly until smooth and crack-free. Roll out and lay over a pie or flan dish and trim the edges. Blind bake with pie weights for 10-15 minutes until golden brown. Allow pie crust to cool. Turn oven down to 160°C (320F). Fan-fry the onion, carrot, broccoli, and the chopped capsicum until just soft. Turn off the heat and add spinach, allow to wilt. Allow veggies to cool. 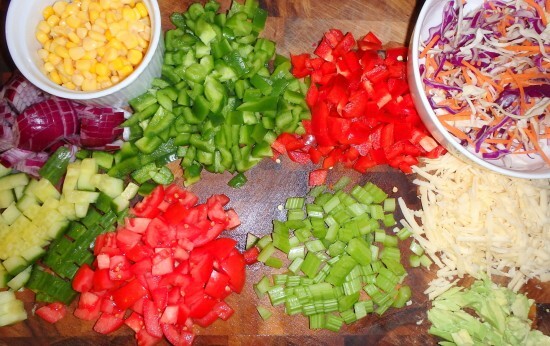 Add the cooled veggies, tomatoes, cheese, and salt to taste to bowl and mix. Add the egg and stir through. Pour the entire mixture into the pie crust base and press down to fill. Decorate with capsicum slices. Bake Quiche at 160°C (320F) for 35 to 40 minutes until golden brown and no longer runny. Can be eaten hot from the oven or served cold the next day. All I can add is that we had it cold the day after she baked it, and it was bursting with flavour. It was one of the most amazing Quiches I have ever eaten. My contribution was the eggs, cheese, and spinach, but her’s was her baking talent! Simply delicious! Give it a try, you will be surprised that this veggie dish tastes so good. Limoncello is a seasonal drink I make each year to reduce some of the glut of lemons that we have around here off our two lemon trees. For those of you that like the odd tipple, it is definitely worth the small amount of effort that it takes to create this amazing vodka based beverage. 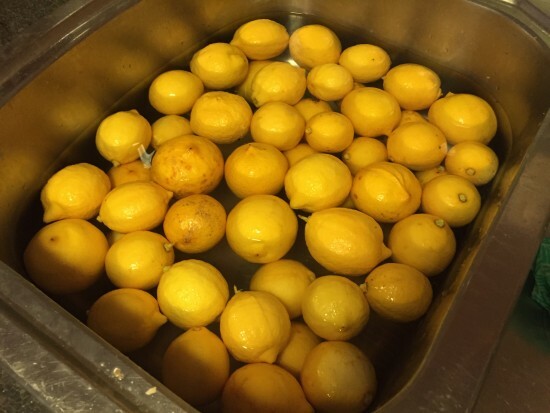 Firstly, I wash all the lemons in a sink full of water that has had a cup full of white vinegar added. This removes any dirt or bacteria that may be on the skins. It also gives the lemon rind an amazing shine to it. Then you gather your equipment. Basically, you need about 9 lemons per 700ml of Vodka, water, and sugar. That’s it. 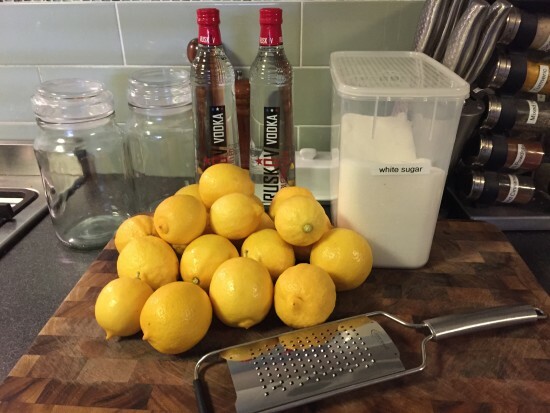 For the full recipe and technique checkout my previous post about Limoncello. I also find that the large Moccona coffee jars are a perfect receptacle in which to infuse all the ingredients. It also has a fairly decent seal so that the alcohol doesn’t evaporate. 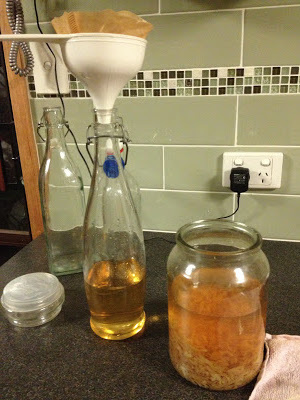 At this stage, mine are still infusing on the kitchen bench, so lets rewind back to 2012 when I made my last batch. Once the infusion process is complete, which can take anywhere from 2 months to 1 year, you then filter and decant into a swing top bottle. You will know when it is ready as an immature batch will still have a slightly bitter aftertaste. 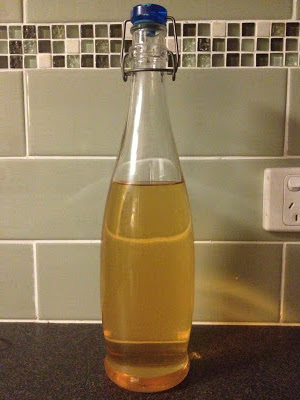 It may take a while for the Limoncello to pass through the filter paper, but the crystal clear liquid is worth the wait. This bottle is one I made in 2012 that lasted us for two years. I think of it as the essence of my garden and is a drink to savoured, not guzzled. I also make a wicked Kumquat Brandy if I can get my hands on some of that fruit during the winter. 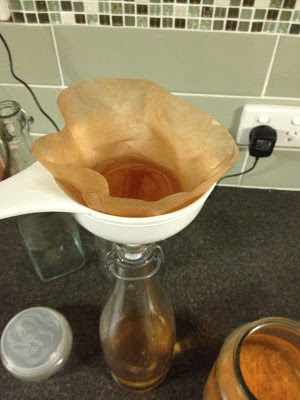 It is made utilising a similar infusion process, and tastes equally as nice. Who else makes a fruit liqueur similar to this? Does yours infuse for a few months or do you leave it for more than 6 months? With summer approaching here in the Southern Hemisphere now that we are past the Vernal Equinox, it is time to start thinking about foods that take us out of our winter long hibernation. Salads are a great dish with which to do that, but how many of you have made up a salad only to find that after a few days it goes limp in the fridge or doesn’t transport very well. Well never fear, Kim to the rescue. 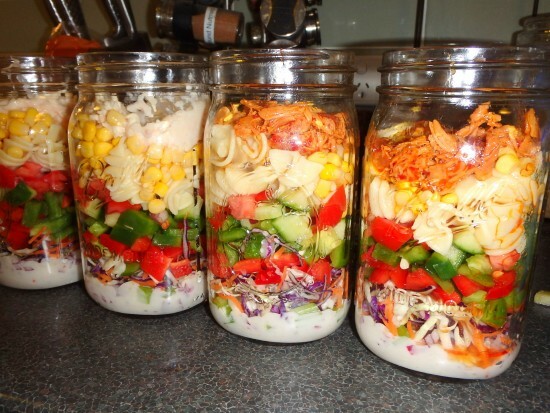 Yes, Kim has found a solution that will fix all your salad woes. 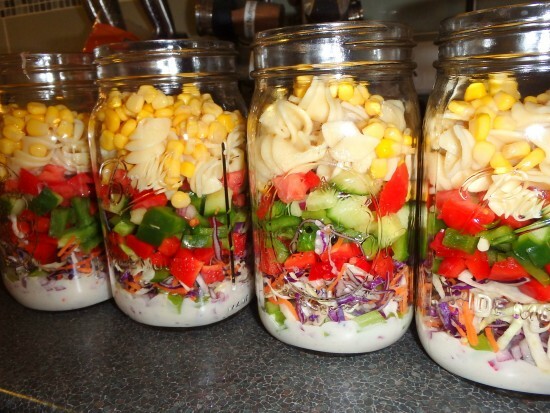 It’s Salad in a Jar! 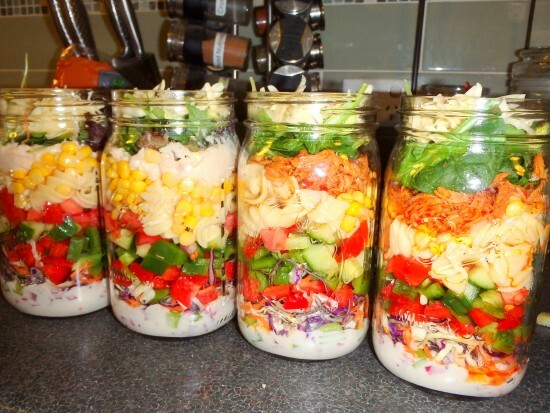 In this post, I am going to step you through the process of making one of these most excellent salads. Firstly select whatever vegetables you have in the garden or fridge. Chop them up into bits ready to complete your salad. 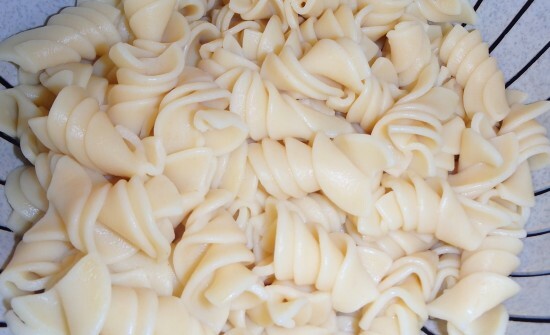 Cook up some organic pasta and allow to cool. 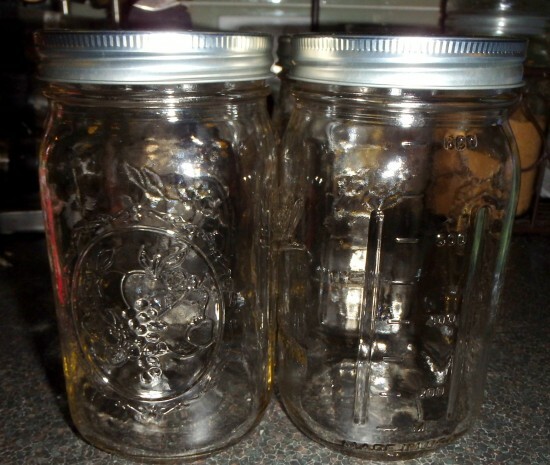 Grab a few 950 ml (1 quart) mason jars and make sure they are thoroughly clean. Add 2 Tablespoons of your favourite dressing. 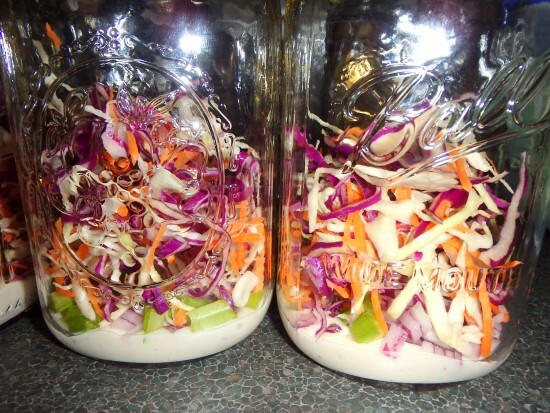 Add the hard vegetables first like onion, celery, cabbage, and carrot. Then add cucumber, red and green capsicum (bell peppers). Add your cooked pasta and some sweet corn kernels. At this stage we add some cooked meat tossed in a separate dressing. You can add chicken, salmon, prawns, crab meat or if a vegetarian, you can add chickpeas, lentils, or beans. Then add lettuce leaves, sliced avocado, and grated cheese (homemade of course). 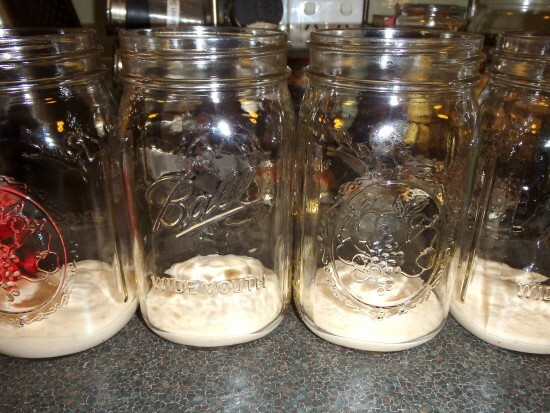 Once the jar is fully packed, screw on the lid tightly and store in the fridge until required. They will last up to a week like this and still maintain its freshness. No limp leaves or soggy capsicum! I have no issues when transporting this meal to work in my backpack. To use it all you do is turn it over top to bottom a few times to mix through the salad dressing, then pour out onto a large plate and eat. Brilliantly simple in its execution! 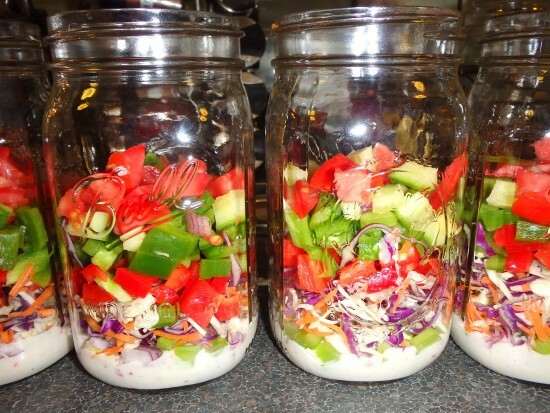 Kim estimates that by using a light dressing the total energy for this balanced meal is around 550 calories (2300 Kj). Pretty good, and these meal are already helping me to shift my excess winter weight as well as extra walking. What do you think? 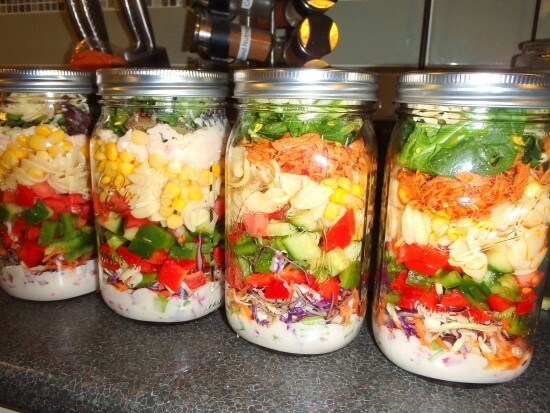 Will you or have you given salad in a jar a try?